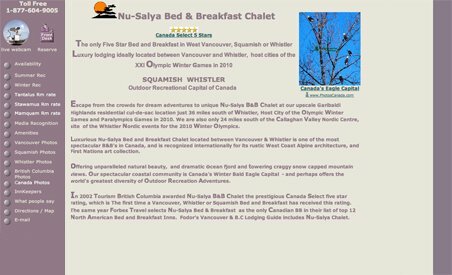 Nu-Salya Bed and Breakfast Chalet is the only five star bed and breakfast in West Vancouver, Squamish and Whistler. It has gained international recognition for its rustic West Coast alpine architecture as well as its extensive First Nations art collection. Nu-Salya is located between Vancouver and Whistler, in one of Canada’s most spectacular settings, with views of dramatic fjords and snowy mountaintops. Guests will also enjoy an outdoor patio and hot tub, free wireless internet and Nu-Salya’s great room, which features an amazing 40 foot rock fireplace. Of course there’s also a delicious, complimentary breakfast.